Xbox One S vs Xbox One: Which One Deserves Your Money? Finally, it has new blood in game console field. Xbox will release its new game console called Xbox One S, Xbox One S 500G and Xbox One S 2T two version following. But does it really deserve to update older Xbox One to the new Xbox One S? 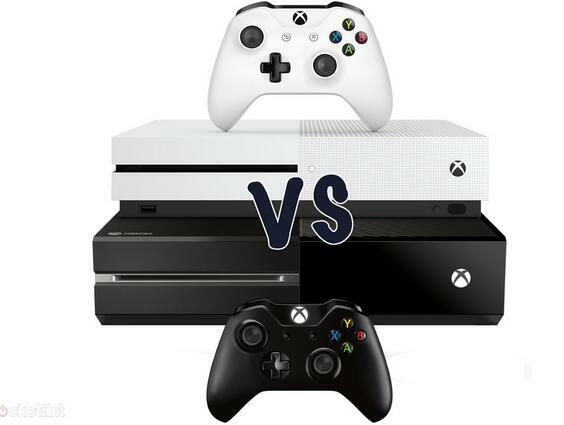 Or which one deserves you to invest, Xbox One or vs Xbox One? Here, let’s compare Xbox One S and Xbox One specs, design, etc to see which one is the best Xbox game console. Design is undoubtedly the biggest and most noticeable change between the original Xbox One and the newer, slimmer Xbox One S. In fact, Microsoft has removed 40 per cent of the body mass, making a console that’s just over half the size of its predecessor. It’s an important change, considering the huge size difference that exists between the PS4 and the Xbox One. As is the fact that you’ll be able place it vertically, and that the power brick is internal. That means instead of having it lie flat, taking up tonnes of room on a shelf and having a chunky power brick lying next to it (or on the floor somewhere), it can neatly stand next to your TV with nothing but a couple of cables attached. It’s clearly a much neater all-round package. Like the Xbox One, the One S’s has a two-face design. One half of the device has a single solid texture and matte finish, the other half is patterned. Unlike the Xbox One, however, it has hundreds of machined holes and dots on one half, and not the diagonal line and slits. This is partly for aesthetic purposes, and partly for cooling. A large circle section underneath the machined holes acts as the air vent to cool all the internal components. Arguably, having it stand vertically with more of its surfaces exposed to the air will help cooling too. Although it’s undoubtedly a much more aesthetically pleasing design in general, at the moment, it is limited to just the white finish initially. In contrast, the current Xbox one has a number of custom designs thanks to tie-ins with some of the most popular game titles. We expect the One S will soon join in with those, especially with the holiday season coming up in a few months. While the console remains instantly recognisable, the updated Xbox Wireless Controller has seen some welcome changes. It looks similar to the original but, like the console, is a touch sleeker and now has a grippy finish underneath the handles to ensure it stays in your hands and doesn’t slip out. It also has twice the range of its predecessor, just so you won’t have to huddle around your TV so closely. And it works with Windows 10 PCs, tablets and phones via Bluetooth too. Apart from its design, the biggest change we see in the Xbox One S is that it’s 4K capable. Not only can it stream 4K Ultra HD content from services like Netflix or Amazon Instant Video, but the console also supports 4K Ultra HD Blu-ray playback. This is a big deal for more than one reason, but predominantly because, for those currently in the market for a decent Ultra HD Blu-ray player, you’ll struggle to find one as competitively priced. Not only are you getting a great gaming console, you’re also getting a 4K Blu-ray player for less than those from the likes of a Samsung or Panasonic. Xbox One S also supports 4K HDR content, meaning videos will have a wider colour gamut and feature a much higher dynamic range in addition to the sharper resolution. In simple terms, if you have a 4K HDR TV, your movies are going to look awesome. HDR capabilities also mean that your games will look better too. Darks will be much darker thanks to the higher contrast ratio. Although it doesn’t support 4K native gaming yet, it is capable of 4K upscaling, so games should look better on a 4K TV regardless. In terms of other features, it’s a case of one lost, one gained. The Xbox One S doesn’t have a dedicated Kinect port, confirming that Microsoft isn’t as concerned about its motion-tracking technology as it once was. However, you will still be able to connect a Kinect using a USB adapter, plugged into the USB port on the console. As for the one gained, the One S has an IR blaster built-in, so that you can switch on your TV, audio receiver or satellite receiver without needing to go hunting for all of your remotes. The USB port is now on the front of the console too, rather than the side. As is the pairing button to connect to wireless controllers. And the on/off switch is physical on the Xbox One S rather than the touch panel found on the original Xbox One. The 2TB launch edition of the Xbox One S is available to pre-order now for £349 and will ship on 2 August. There will also be both 500GB and 1TB versions of the console to follow, priced at £249 and £299 respectively. In comparison, you can pick up the current Xbox One in various bundles and deals starting from around £230. If you are in a mad dash for an Xbox One because a game has just been released and you’re not bothered about the size or added features, you can probably find a bargain out there for the original model. But it could be worth holding off, especially if you have a 4K TV. If you’re already in the market for a 4K Ultra HD Blu-ray player, then it’s hard to see a reason not to buy an Xbox One S. Even if you already have an Xbox, it could be the sole reason to encourage you to upgrade. HDR gaming might also be something you’d like to have for your brand, spanking new 4K TV. And the entry level price of the S is reasonable to say the least. However, if you’re happy to wait and want true 4K gaming, you may be best to hold off until next year. Project Scorpio is coming at the end of 2017 with 4K gaming and high quality VR. But it will no doubt be very pricey on launch, so that could be a factor too. At least Microsoft has promised that all games released for Xbox will be compatible across all of its machines, just with slight benefits for the consoles with more oomph. We know that both Xbox One S and Xbox One support to play Blu-ray/DVD discs. But only the Blu-ray/DVD that are sold in the same region as the game console manufactured can be played on Xbox One. Pavtube ByteCopy can remove the region protection from Blu-ray/DVD movies and 1:1 backup them for Xbox One S and Xbox One, Xbox 360. You also can choose to convert Blu-ray/DVD movies to MP4, MKV and other Xbox game console supported digital format to play the movies via USB port. ← Previous Previous post: How to Fast Rip and Stream DVD Movies to Amazon Fire TV?